Ethan Dmitrovsky, M.D., director of the Frederick National Laboratory and president of the laboratory’s current prime contractor, and Timothy E. Trainor, Ph.D., president of Mount St. Mary's University, sign the partnership agreement. 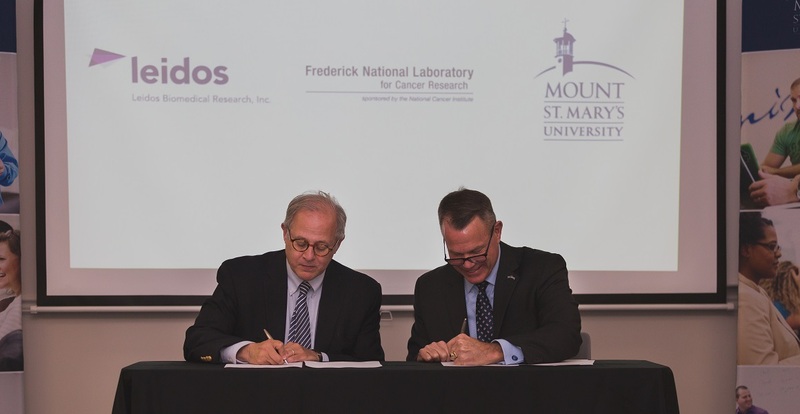 The Frederick National Laboratory for Cancer Research is expanding its commitment to educate the next generation of scientists and foster academic research collaborations by signing a new partnership agreement with Mount St. Mary’s University. Under the three-year memorandum of understanding, the university and the national laboratory will work together to identify a researcher with expertise in such areas as bioinformatics, data science analytics, and cybersecurity to receive a dual appointment at the Mount and Frederick National Laboratory. The professor will teach undergraduate or graduate courses at the university and work up to two days a week or summers at the national laboratory. The agreement also calls for a summer research experience for Mount St. Mary’s science, math and computational science faculty to work at the laboratory, teacher-in-training opportunities for postdoctoral fellows and other scientists, and an internship program for Mount St. Mary’s students to work at the national laboratory. In addition, eligible Frederick National Laboratory employees will receive a 20 percent reduction in tuition for adult undergraduate and graduate degree and certificate programs housed and supported at the Mount St. Mary’s Frederick campus. “This exciting partnership opens several significant doors to Mount students and faculty in Emmitsburg and Frederick, while also creating teaching and learning opportunities for employees of the Frederick National Laboratory,” said Mount St. Mary's University President Timothy E. Trainor, Ph.D. "We envision this robust and multi-faceted program will grow to become a center of excellence that connects the university, employers, researchers and Frederick County communities in innovative ways." 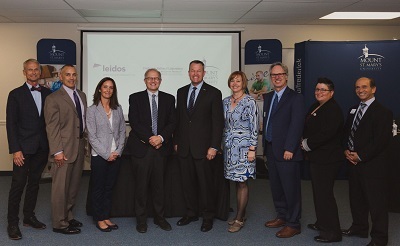 The partnership follows collaborations signed earlier this year with Georgetown University, Hood College, and the National Cancer Institute of Mexico. Pictured above from left are Frank Blanchard, director of public affairs and communications at the Frederick National Laboratory (FNL); Jim Pannucci, director of the FNL Partnership Development Office; Monica Slate, executive assistant at FNL; Ethan Dmitrovsky, M.D., director of the Frederick National Laboratory and president of the laboratory’s current prime contractor, Leidos Biomedical Research, Inc.; Timothy E. Trainor, Ph.D., president of Mount St. Mary's University; Jennifer Staiger, Ph.D., MSMU's associate provost of;graduate, professional and continuing education; Boyd Creasman, MSMU's provost; Andi Overton, MSMU's director of business development; and Jack Chielli, MSMU's vice president for enrollment management, marketing and communications.